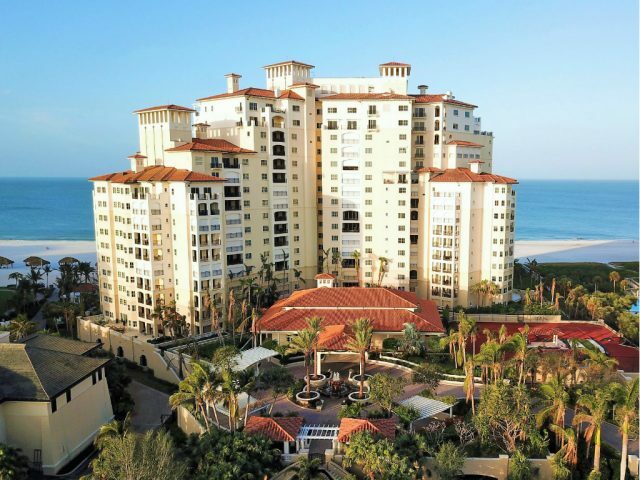 Located at 350 S. Collier Blvd, the Madeira on Marco Island was completed in October 2006 and is known as the last beachfront condominium ever to be built on this Island of Paradise. They apparently saved the best for last! This upscale, vintage European design is limited to 101 residences ranging in square footage from 2,631 up to 6,500. There are 8 units per floor for the 1st 10 levels, then 4 units per floor as it cascades up with the Estate Residences and then topped off with 2 Penthouse level units. The “beach level” has 7 residences each with an expanded garden terrace and stairs directly down to the beach. In addition to the Madeira Pavilion amenities (movie theater, fitness center, tennis courts, social room), residents can elect to join an Ambassador Membership at The Marco Island Marriott Spa and the Rookery Bay Golf Club. It’s not just “condo” living anymore, it’s an expanded, pampered lifestyle. Pets: 2 dogs or cats Rental Policy: Annual rentals only.